The indignity of it all. It’s not enough I have to endure being called a skunk just about every other time I meet new people, now somebody’s gone and made a COSTUME for a black Scottie to turn into a skunk one night a year. At least it’s only one night. Then the really ignorant of the species spy my glorious white chest and belly and think THAT’S what a skunk looks like. Honestly, if I’m called a skunk one more time, I think I’ll just hurl. Yeah, that’s what I’ll do. Hurl. Green beans and all. That’d be pretty. 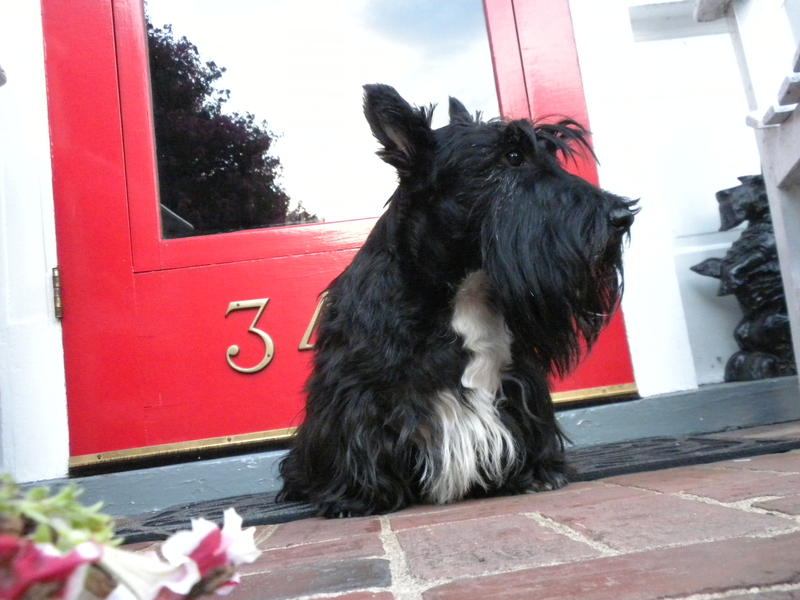 Listen, if you’re tempted to dress up your Scottie like a skunk for Halloween, just don’t come knocking on my door. I’m very offended when people call me a skunk just because I have white markings. My peeps get very offended when people call me a skunk. Now somebody’s gone and made a skunk costume for black dogs on Halloween. I implore you: GIVE IT UP. In my name, just boycott this stuff would you please? Somebody outta make a tuxedo costume for Halloween and model it after moi. By the way, in Scotland, where I’m from, All Hallow’s Eve marks the beginning of Celtic New Year. Now that’s cause for celebration. 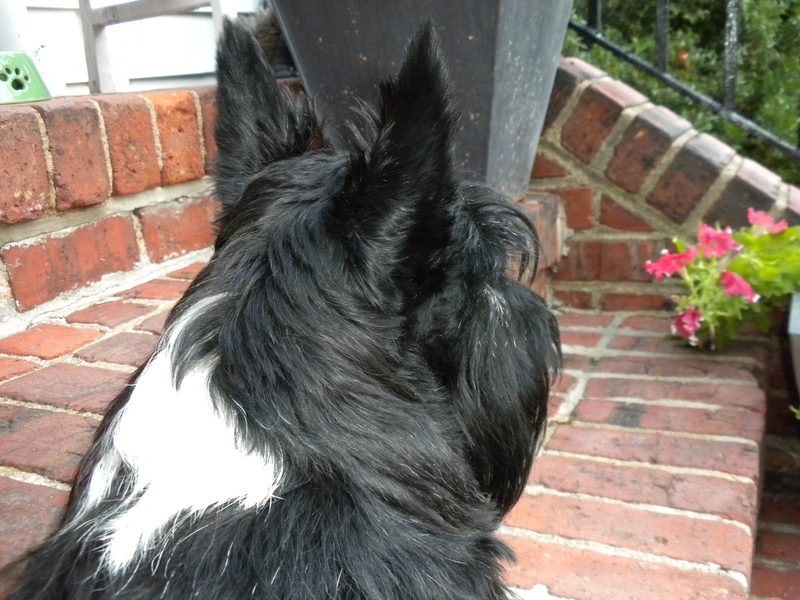 This entry was posted in The Scottie Chronicles and tagged All Hallow's Eve, Celtic New Year, dog halloween costumes, dogs, pets, Scotties, Scottish Terrier News, skunk. Bookmark the permalink. O.K. Stuart I hear you ~ you PENQUIN! You tell em Stuart!! I think you are great just the way that you are!! SKunk?? who’d wanna be that anyhows?? Yah, I would say you take care of anyone calling you a skunk thats fur sure!! I’m thinking I’m just going to have to take ’em down. Yeah. Forget hurling. I’ll take down anybody else who calls me a skunk. Fergie thinks it is a good look for you, not so much for the ‘coppydogs’..
Fergie is dazzled by your white markings since all black Scotties look the same, and here you get to wear a ‘Tuxedo’ every day..
wear your white and be proud!!! You may have a point there Georgie B. Perhaps it IS an attempt to flatter moi. Just tell them the truth-you’re markings are very rare and sought after. It could be worse-Dalmations are called leopards because of the spots and leopards are c-a-t-s. He made “terrier bread” yesterday while watching sports. When he tries a new recipe and it bombs, he feeds it to you know who. I love it. Don’t hurl-it is a waste of food. The mention of food makes me hungry-I’ll go beg for more terrier bread. I’ve never thought of the Dalmatian C-A-T-S. Thank you for bringing this to my attention ever-wise-one-Kyla. Now. About that terrier bread. Just what’s in this stuff? Georgie B! She’s just kidding you!!! This one was a sourdough dark rye. It didn’t rise enough. Terrier bread comes in many flavors but any one flavor is only used once. The common thread of terrier bread is that She doesn’t like it and He throws out the recipe and we terriers WIN! Oh…That sounds good. She had a bread machine once. It kneaded, but didn’t bake. Glad I didn’t get the dough. Would you eat the dough?? I eat anything, but no it wasn’t dough. It kinda never got too big and dropped in the oven where most breads rise a little more. It was to big to use as a hockey puck, so it is terrier bread. My thought was same as Georgie B, that it was an attempt at a Stuart costume. You guys are just the best! A STUART costume! Why didn’t I think of that????? Fergie wants me to wear a Stuart costume…. PIPPI LA PEW!!!!! Kiss her for me would you? SHE thought the skunk costume was cute! But WE didn’t. We get called lots of things, but never a skunk! Glad you girls are sticking with me on this.